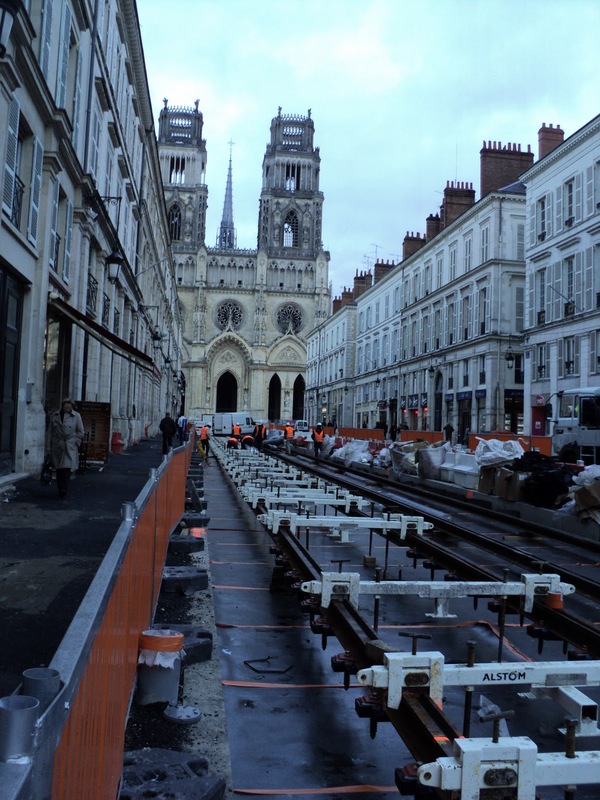 Joyeux anniversaire to the Orléans tram system, which turns ten years old today. My kids act like we're going to Disney when I tell them we're taking the tram... Thankfully, it's a little cheaper. There's a park and ride lot just 15 minutes from home, and it's 2€ per carload. Then it's a 12-minute trip into the city from there. That compares to the 7€ I paid once-- only once-- for a few hours of parking in the main square's underground lot. Currently, the tram route runs north to south... Now, it's being expanded east to west. It's a mess downtown, and it surely spoils what's always been a stunning view of the city's famous cathedral. But this part of the work should be wrapped up in a few months. The new line will be open for 2012. BTW, the cathedral has had a few more birthdays than the tramway. Construction on this Gothic masterpiece began in 1278... More on Cathédrale Sainte-Croix in a future post.